If more than 4 adults stay in an apartment, the supplement for each extra person is 24 €. If you want to reserve an apartment with own sauna, the extra cost is 3 € / person. One conference room is available free of charge to conference delegates staying at the apartment hotel. 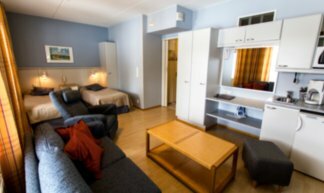 If more than 4 persons stay in an apartment, the supplement for each extra person is 40 €. The prices include accommodation 1 night, breakfast, free use of spa and gym, leisure programme (Mon-Sat).